Right now, in your town and neighborhood, policies are being implemented that will ultimately eliminate your freedoms and destroy your way of life. You need to know what’s going on to stop this process. Many town officials are selling us out to global regional development with help from the International Council for Local Environmental Initiatives (ICLEI): Local Governments for Sustainability. [See new ICLEI website here.] 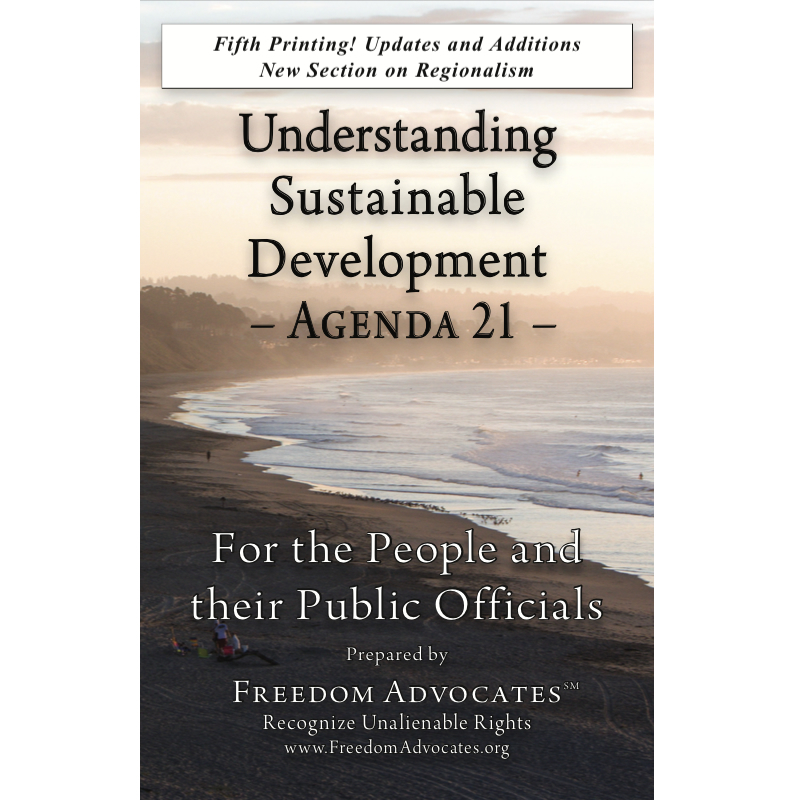 ICLEI is used as one of the mechanisms to undo the political recognition of unalienable rights. 2011 ICLEI USA member list (ICLEI USA Members arranged in an easy to read, by State format – May 2011). ICLEI uses the false premise and outright lies of anthropogenic global warming to change our way of life, for the worse! 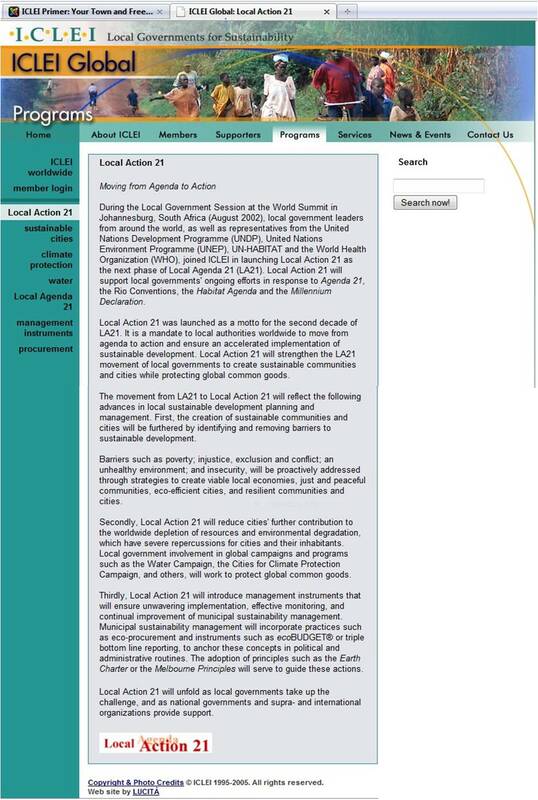 ICLEI: Local Governments for Sustainability promotes Local Action 21, Local Agenda 21 and other United Nations programmes [also see ICLEI Members Bulletin – International Sustainability Updates] implemented through local town councils, planners, mayors and local governments. Social engineering and behavior modification are some of the true objectives being implemented under the guise of environmental and climate protection. This is accomplished by exploiting people’s desire to maintain a healthy and lasting environment in the name of “sustainability”. Here is an example of how ICLEI changes behavior, just like another organization called “Fostering Sustainable Behavior”. It is also ICLEI’s job to implement United Nation’s policies that restructure our representative form of government through global and regional development (<click and then view slide show). Policies and programs take control from our representative government and put it into the hands of regional, non-elected boards. This allows elected officials to shirk their responsibilities. It turns us into a soviet system that is based on Regionalism. It facilitates both communism and fascism. Representative government with defined limits is the basis of a free and just society. Is ICLEI running your town or coming to a town near you? Are your elected officials being lured into enacting ridiculous rules and regulations in exchange for funding? Do your elected officials know that there are long term consequences to their irresponsible actions? Currently there are more than 550 communities in North America paying membership dues to ICLEI. Upon becoming a member of ICLEI, members become governed by the ICLEI Charter (see 2003 ICLEI Charter and 2011 ICLEI Charter). If your community is one of these, you are paying for the loss of your unalienable rights. You as an individual or part of a group can make a difference! Pursue documentation evidencing ICLEI involvement. Review article with document search information here. Elected representatives need to cease involvement with ICLEI. Don’t let ICLEI policies ruin your town. The global village of the future is not the vision of our dreams and will hold no safe harbor for anyone. Listen: Click here for Dr. Stan Monteith radio interview with Jeannie Soderman on ICLEI – the history, structure and ramifications. Listen to the 2-part radio program Colorado: Kick ICLEI Out! Hour 1 and Hour 2. Michael Shaw discusses ICLEI with guest Stacy Lynne of Colorado.